Browse the departments in our store directory at right. Find the products you want. You’ll know that the companies you link to manufacture their products right here in the USA, employing American workers. You’ll support American jobs – and help strengthen our country’s economy – by purchasing products from these companies. 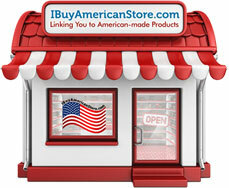 You may know of other American-made products you’d like to see on IBuyAmericanStore.com. If so, please suggest the companies to us. IBuyAmericanStore.com has researched the companies listed on this website to validate that their products are manufactured in the United States of America. Some of these companies may also manufacture certain products in other countries – and sell these products on their websites, along with their American-made products. Please verify that the items you order from these companies, as a result of linking to them from IBuyAmericanStore.com, are not manufactured elsewhere.